1. Watching him and Roberta Flack singing together on the Free To Be You And Me TV special. 3. Wearing one glove that my Mum sewed sequins on and it was SUPER-COOOOOL!! 4. Thinking it must be BRILLIANT to have a monkey. Hey, when you sell 25 million albums, I defy you to not go a bit mad and buy crazy stuff. When you have a bajillion bucks, you can buy a monkey with no questions asked. Well, people can ask but you don’t have to pay them any mind; because you have a bajillion bucks. When I have a bajillion bucks, I am absolutely going to buy a monkey. 10 monkeys!! AND a Unicorn!!!! Unicorns don’t exist, you say? Huh, if I had a bajillion bucks, you can be damn sure they WOULD. 9. In college, seeing the devotion that the girl who worked in the shop ’round the corner from my flat lavished on him. She had the jacket, the T-shirts, pins, EVERYTHING, probably knickers too. She played every CD over and over again and couldn’t be found for 5 days before tickets for the HIStory tour concert in Dublin went on sale. Camping on the street for 5 days in rainy Ireland; no small thing. 10. Finding out that my partner, Matthew, could sing ‘Don’t Stop Till You Get Enough’ near-perfectly and being the proudest girlfriend-person at karaoke. Despite the past 15 or so years, the demons, the weirdness, the skin-bleaching, the last few albums, the suspicion, the marrying of Elvis’ only child, almost thowing a baby off a balcony, ect, ect, ad nausium….I felt a bit sad. 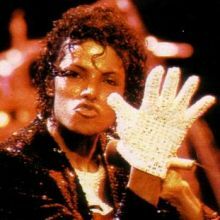 A great pop culture icon died and Jacko took a piece of my formative years with him. At the same time, the news also made me remember all the fun times I had listening to and watching what is now his legacy and once-in-a-generation contribution to the worldwide zeitgeist. Everywhere I went today; I was hearing “Shacka-Ooooohs!”, Vincent Price’s haunting laugh – that caused me to pull the needle off the LP just before the end of the song when I young – and several “Annie, are you OKs?” I saw kids with their dad waiting at a crosswalk doing the Moonwalk and two rather large gentleman gave me the ‘Air-Punch’ sign when hearing I Want You Back on my car stereo. 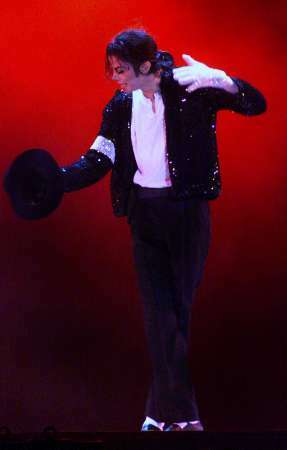 And, in the words of a Smooth Criminal – “OK, I want everybody to clear the area right now!” Let him RIP. Who knew? The man was human after all. My favorite memory? Your partner Matthew forced me to play the “girlfriend” in his living room reproduction of the entire “Thriller” vid. Lindsay, please tell me this performance was taped. It would be like all my birthdays and Christmases came at once!!!! Michael (Mr. Jackson??? ), I haven’t read much about the details and figure that lots of things will remain a mystery and, like Elvis, there will soon be sightings of him in Brazil, working in a gas station, on the moon, ect. So I’m not sure. What I will say is that when I heard the news, I played an MJ song and my building’s power went off right in the middle of it. Then, coming back from dinner, I heard my blender going and the switch was in the off position. Now, I’m not saying MJ was haunting me but it all stopped when I wrote this article. It pleases me no end to think MJ might have been a fan. I don’t know about Lindsay’s Smooth Criminal being on tape but I know there’s a tape of Matthew, Melissa and Lindsay in a March of Dimes benefit show. One of the dance numbers was Thriller and I believe Matthew had a line in the We Are the World finale. You actually just made me laugh AND cry. This is so well done. Btw I was in SF for the Dyke March this weekend, and Lind and Tammy’s band were playing to the thousands of happy marchers. When they busted out Billy Jean it was a moment to remember forever!!! Very cool vid Sasha! Loved the sporadic “HEE Hee”s comin from the crowd.